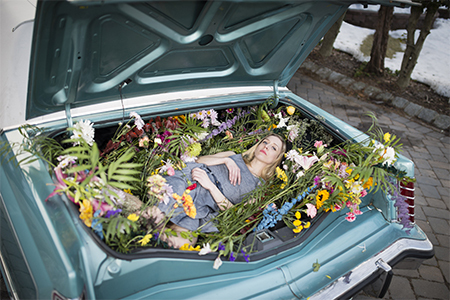 West Windsor, N.J. – Mercer County Community College (MCCC) alumna Hayley Monek (’14), of East Windsor, has a talent for creating photographs that tell a story, but ask the viewer, indeed compel the viewer, to fill in the blanks. The result is an array of work that combines reality with the fantastic – with sometimes amusing and, other times, disturbing results. She is putting her unique vision to work as a student at the School of Visual Arts (SVA) in New York City, where she has transferred to earn her B.F.A. after graduating from Mercer with an A.F.A. in Photography. Monek says she is inspired to create nonlinear narratives that leave part of the story to be deciphered by the viewer. “I strive to question reality throughout my work…by setting scenes that relate to reality, while also alluding to whimsical or other narratives,” she says. 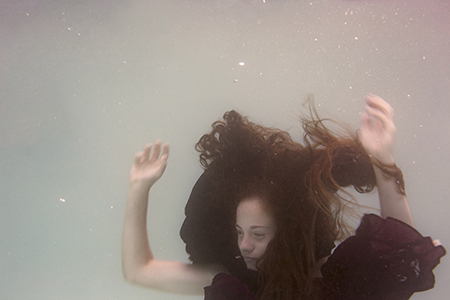 Monek is sharing her photography in a new self-published book entitled AQUAFORMATIONS, a children's book that combines photography and illustration as it tells a story about a young and adventurous girl who has the power to travel through water. Monek had the opportunity to show off her new book as part of the School of Visual Arts B.F.A. Photo Table at the Printed Matter's 10th Annual NY Art Book Fair held Sept. 17-20. She was among some 370 booksellers, antiquarians, artists, institutions and independent publishers from twenty-eight countries to participate in the fair, which is billed as the world’s premier event for artists’ books, catalogs, monographs, periodicals, and zines. Attendance at last year’s fair numbered more than 35,000 people. Aquaformations features 38 images that combine photography, painting, and watercolor illustration. Monek’s story features a young girl named Estella, who has the power to transport herself through water to different bodies of water around the world. Despite her mother’s warning, Estella pushes further and further to explore the underwater world. As a result, she finds herself in a perilous situation. "This is my first storybook project, and is a new and exciting extension of my previous work," Monek says, adding that it is very important to her to feature female leads as her subject. She also notes that she was inspired by the author Neil Gaiman in the making of her book. She notes that her MCCC education in photography and other visual arts prepared her well for transfer. “I was taught by so many fantastic professors at Mercer. I continue to use what I learned from them in my daily life at SVA,” she said. MCCC Professor Michael Chovan-Dalton, coordinator of the Photography program, recalls Monek as a stand-out student. “She worked closely with me, Sarah Sweeney [former professor of Digital Media Arts], Fine Arts faculty member Lucas Kelly and English/Journalism faculty member Holly Johnson outside the classroom to gain as much knowledge and experience as she could while she was here,” Chovan-Dalton said. Monek’s first run at publishing is delightfully personal. She created 20 handmade copies of AQUAFORMATIONS for the MOMA PS1 fair. She has several left, which are available for purchase by visiting her website, www.hayleymonek.com, and clicking on the AQUAFORMATIONS tab. She plans to follow up this first work with a second edition of Estella’s adventures in a traditional book form. 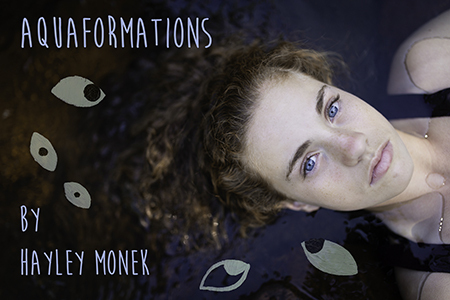 The cover of Monek's book AQUAFORMATIONS features Estella, who can transport herself around the world underwater. From AQUAFORMATIONS: Down the well Estella goes. From AQUAFORMATIONS: Going down, down, down -- and around the world. One of Monek's self-portraits that compels the viewer to fill in the blanks.